The bench press, in one form or another, is part of almost everyone’s workout, but what’s the best way to do it? You may have seen Brad Schoenfeld’s post about the just accepted study of his that confirms the well-known link between muscle activity and poundage (higher weight = higher activity | see EMG Series). Well, another recent study provides additional intricate insights into the link between muscle activity and the way you perform the bench press. Just like Schoenfeld et al.’s study, the study compared the muscular activation during bench presses – albeit in this case that of the pectoralis major, anterior deltoid and triceps brachii during a freeweight barbell bench press performed at different angles: 0°, 30°, 45° & -15° angles, to be specific. “[…] have the potential to attenuate any difference in muscle activation observed during the complete lift between bench angle conditions as differences in activation may have been evident throughout different time points of contractions” (Lauver. 2016). Accordingly, the primary purpose of the present investigation was, as Lauver et al write “to compare the changes in muscle activation at various time points across contraction phases (concentric, eccentric) during free-weight barbell bench press at varying bench angles (–15°, 0°, 30°, 45°) while maintaining the same absolute resistance load” (Lauver. 2016). The scientists hoped that the results of their study would lead to a better understanding of the effect of bench angle on muscle activation during bench press exercise and “aid in selection of variations in bench press exercise to develop upper extremity strength and musculature” (Lauver. 2016). So, 80% = maximum activity – Why did the scientists use 65% 1RM? If Schoenfeld et al. found that you need 80% of the 1RM it may initially appear to be a methodological shortcoming to use only 65% of the 1RM. On the other hand, the fact that high loads, alone, maximize the muscle activity may nullify the significance of angle- or phase dependent differences… I cannot tell you, however, whether that’s what the scientists had in mind when they decided to go for “only” 65% of the 1RM or whether they simply wanted to avoid fatigue having an effect on subsequent sets. For their study, Lauver et al. recruited 14 healthy resistance trained men (age 21.4 ± 0.4 years) who performed one set of six repetitions for each bench press conditions at 65% one repetition maximum. As in previous studies, Lauver et al. used surface electromyography (sEMG) to quantify the muscular contraction. In contrast to previous studies, however, they analyzed the corresponding data during four parts of the lift individually – not just for the whole lift. Figure 1: Upper and lower (U- / L-) pectoralis major activity during eccentric (UA / LA) and concentric (UB / LB) quarts of the bench press at different angles (-15°, 0°, 30° and 45° | Lauver. 2016). 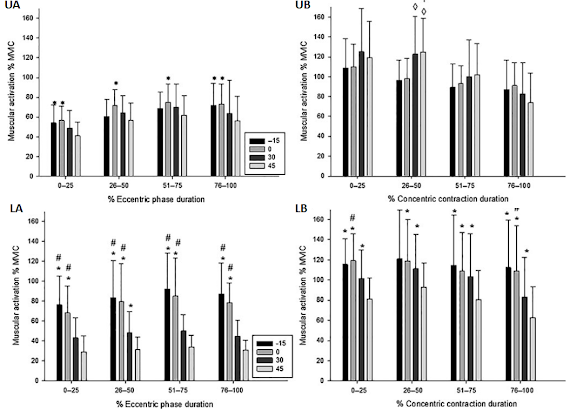 Differences were found for 26–50% contraction for both the 30° [122.5 ± 10.1% maximal voluntary isometric contraction (MVIC)] and for 45° (124 ± 9.1% MVIC) bench condition, resulting in greater sEMG compared to horizontal (98.2 ± 5.4% MVIC) and –15 (96.1 ± 5.5% MVIC). The sEMG of lower pectoralis was greater during –15° (100.4 ± 5.7% MVIC), 30° (86.6 ± 4.8% MVIC) and horizontal (100.1 ± 5.2% MVIC) bench conditions compared to the 45° (71.9 ± 4.5% MVIC) for the whole concentric contraction. Overall, the study results obviously still confirm what you’ve read previously at the SuppVersity: “[T]he use of a horizontal bench to achieve muscular activation of both the upper and lower heads of the pectoralis” (Lauver. 2016). This doesn’t mean that adding an incline press to your regimen would be useless. As Lauver et al. point out, there’s still use for the incline bench press – specifically at 30°!, because it “resulted in greater muscular activation during certain time points”, so that the overall results of the study suggest “that it is important to consider how muscular activation is affected at various time points when selecting bench press exercises” (Lauver. 2016). Bottom line: The implications of the study are not 100% straight forward. But overall it appears as if there were two take home messages: (1) If you’re doing just one exercise, you should stick to the flat bench (or vary cyclically). (2) If there’s room for another bench press you should favor the 30° over the 45° degree bench press, because it achieves the same upper pectoralis activation as the 45° incline bench press, but a great lower pectoralis activation. What is a bit surprising, but may be due to the differences in methodology compared to the previously cited study in the SuppVersity EMG Series is that there were no measurable advantages of the decline bench press, which may have benefited from the subjects’ ability to lift more weight in previous studies. If that’s the same for you, I personally wouldn’t discount the decline press yet – you will, after all, probably not lift with 65% of your 1RM, right? Lauver, Jakob D., Trent E. Cayot, and Barry W. Scheuermann. “Influence of bench angle on upper extremity muscular activation during bench press exercise.” European journal of sport science (2015): 1-8. Schoenfeld, Brad J; Contreras, Bret, Vigotsky, Andrew D.; et al. “Upper body muscle activation during low- versus high-load resistance exercise in the bench press.” Not yet published; private communication on Facebook (2016).